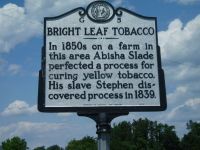 In 1850s on a farm in this area Abisha Slade perfected a process for curing yellow tobacco. His slave Stephen discovered process in 1839. In 1839, a twist of fate led to one of the most important breakthroughs in North Carolina agriculture history. 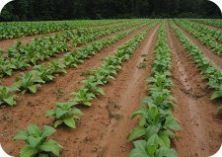 Tobacco had always been a major crop for the region, but not until the accidental development of the “bright leaf” variety did the market for the product really start booming. 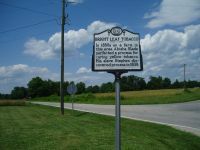 Stephen was a slave on the farm of planter Abisha Slade near the Virginia border in Caswell County. He worked as a blacksmith on the Slade farm. Another of his jobs was overseeing the curing process of the tobacco crop. On one occasion, due to the warmth created by the fire, Stephen fell asleep during the process. A few hours later, he woke up to find the fire almost completely out. To try to keep the heat going, he rushed to his charcoal pit (part of his blacksmithing operation) and threw hot coals on the fire which created a sudden, immense heat. The heat from the charred logs cured the tobacco quickly, leaving it with a vivid yellow color. The trade press in the late nineteenth century investigated the discovery of the process, interviewing those still living with firsthand knowledge of the events. The account is one which has fascinated North Carolinians for generations. The flue-cured tobacco became known as bright leaf tobacco and the variety became popular with smokers. Other farmers learned of and used the new process as well. Although the discovery took place on a piedmont plantation, farmers in the coastal plains soon adopted the process and constructed curing barns by the hundreds. By 1857, Abisha Slade was harvesting 20,000 pounds annually and making some of the highest profits ever. Bright leaf tobacco led North Carolina to a dominant position in the tobacco industry.